What a thoughtful gift for a new Grandpa. 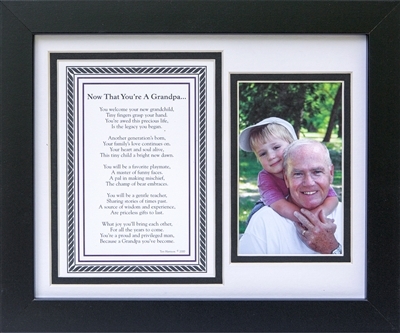 Our classic 8x10 black frame includes a place for 3.5x5 or 4x6 photo and Now That You're a Grandpa poem by Teri Harrison. If you are looking for a special sentiment for a new grandpa, this poem paired with a picture is a great Father's Day gift or first grandchild gift for a new grandfather. I purchased this for my dad for Fathers Day and he loved it. It's a beautiful poem and the picture looks great in the frame. We received it quickly too. I'm very satisfied with the product and service. This is my second time shopping on this website and it won't be my last!